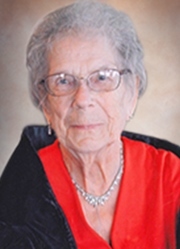 Obituary for Rosalie Nelson (nee Côté) | Mission View Funeral Chapel Ltd.
After 100 years of accomplishments, hardships, adventures and joie de vivre, Rosalie Nelson (nee Côté) passed away peacefully on January 3, 2019 in Calgary, with family by her side. Rosalie was born in Plamondon on June 11, 1918 to Ephrem Côté and Clara St. Jean. Rosalie had a great love for photography, scenic journeys, music and a good game of cards. She will be missed greatly by her three nieces, Rita Ellan Rosalie Côté Vandermeer (John Vandermeer) and Valerie Côté (Alvin Brockman); two nephews, Norman Côté (Simone) and Colin Côté (Brenda); great-nieces and nephews and great-great-nieces and nephews extended family and dear friends. Rosalie was predeceased by her husband Ross Nelson; brother, Evangeliste Côté; and nephew Denis Côté. Funeral Mass will be celebrated at St. Patrick’s Catholic Church (1414 Shawnessy Boulevard S.W., Calgary, AB) on Monday, January 28, 2019 at 11:00 a.m., a second funeral service will be held in St. Isadore’s Catholic Church in Plamondon, AB on Tuesday, February 5, 2019 at 11:00am. Interment will follow the service in St. Isadore’s Catholic Cemetery, Plamondon, AB. If friends so desire, memorial tributes may be made directly to the charity of the donor’s choice.